When it comes to eating healthy, I get into trouble when I’m out running errands. Usually I’m in a hurry leaving the house and just don’t have the time to get something prepared. Running late is my cardio. Sticking to a eating plan is tough for busy moms. It’s weird because I didn’t have this issue when I worked outside of my home. I used to keep healthy snacks in my purse. If I get hungry, then I can grab a snack and be on my way. Since I’m focused on eating healthy, the healthy snacks in the purse thing really helps me out. Plus, it cuts down on kid whining when I whip snacks out of my purse while out and about, I love it! Nuts– Since one of the things that is keeping me on track with healthy eating, is protein, I need lots of nuts in my life. I keep a packet in my purse and take them out when I need them. Fresh Fruit– Now, I probably won’t be caught putting a banana in my purse (ok I totally put bananas in my purse! ), but apples and oranges make great fresh fruit in the purse options. I put it in a baggy. String Cheese– If I’m going to pick up the kids from school, then I’ll grab a string cheese for my purse. I love string cheese and it’s actually hard to stop at one, some sometimes I bring two along. Chopped Up Veggies– A major go to of mine is chopped of veggies, so it’s super awesome to bring these along with me and put them in my purse! My kids love raw veggies too, well, most veggies. If you want to be really fancy, grab some hummus in a small container and dip the veggies in it! Snack balls– I like to recreate my own version of snack bars/balls. I try to put things like peanuts, chex, and cheerios in them to lessen the carb intake. This is an excellent snack to have in my purse for on the go. Homemade Gummies– We all love fruit snacks, but these aren’t ideal for a healthy diet. However, making your own gummies is one way to ensure you’re not getting added sugar. Snack Bites– These are my go to because they are so easy. Take oatmeal, peanut butter, and chocolate chips and roll them into balls and bake them. They are so yummy! Banana Bites– I’ve been seeing these around Facebook lately, so I made some for my “purse.” Although I put these in a hard container so they don’t get squashed. You take bananas and dust with unsweetened coconut shreds. So yummy and delicious. Healthy Muffins– I love to make turkey meatball muffins or oat flour muffins and then take them on the go. I think there are so many fabulous muffin recipes that are healthy nowadays. Plus, sometimes it curbs my sweet tooth. Veggie Wrap– I take a low carb tortilla and load it up with veggies and it’s incredible. I choose all veggie because they seem to last a little longer in a container in my purse when I’m on the go. When it comes to eating healthy, you have to be prepared. 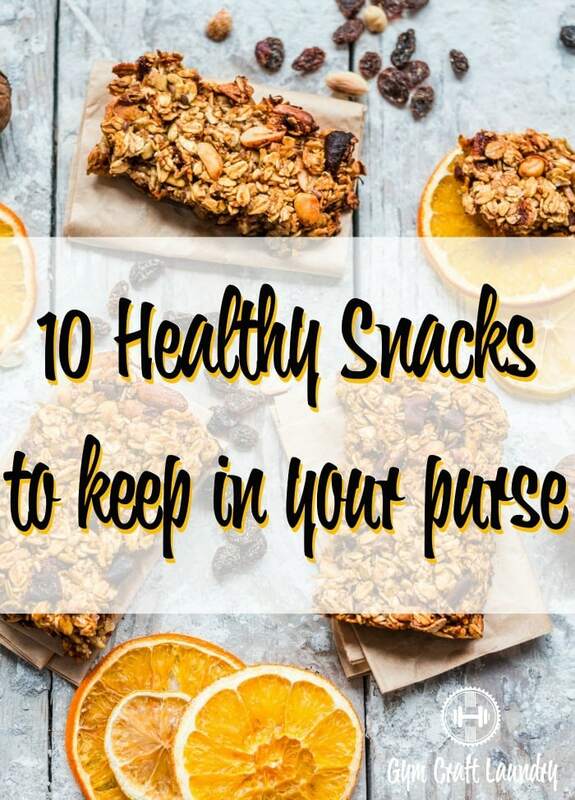 What is your favorite healthy snack to hoard in your purse? Maybe I can add it to the normal stash of healthy snacks in my purse. Great suggestions here! I always keep nuts in my bag as a go to snack for myself or the kids! Yep! My kids love pistachios and cashews!